The shoulder is a ball and socket joint. The ball is called the humeral head; it is the top of the humerus bone of the upper arm. The socket is called the glenoid. 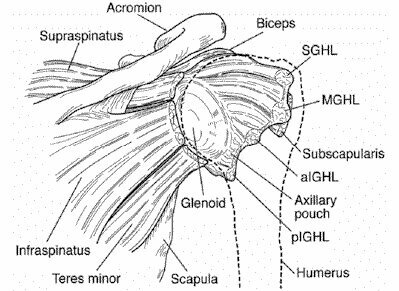 The shoulder is the most mobile joint in the body. This great mobility allows the shoulder to move with a great degree of freedom. But the shoulder pays for this great mobility by having the least amount of bony stability of any large joint in the body. Consequently, it is also the most commonly dislocated large joint in the body. The humeral head is like a golf ball balanced on a tee (the glenoid socket), and is highly dependent on soft tissue structures, such as ligaments and muscles, to stay located in its joint. The shoulder ligaments can be stretched out by either a single traumatic event, such as a dislocation, or by multiple minor insults without trauma, such as excessive swimming or throwing. Shoulder instability can cause shoulder pain, weakness, and dysfunction. It can also excessively stress the Rotator Cuff, leading to Rotator Cuff disorders. Shoulder instability that comes from swimming, tennis, throwing, overhead work, and other repetitive, non-violent activities is called “Atraumatic Shoulder Instability”. Many people who develop Atraumatic Shoulder Instability are “loose jointed”, having lax ligaments to begin with. 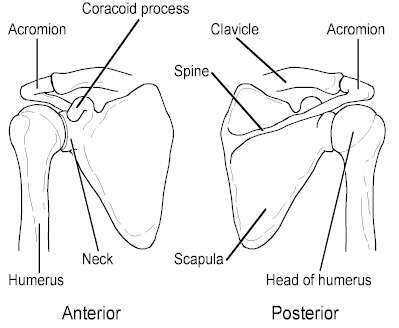 Through repetitive overuse their shoulder ligaments slowly stretch out over time until they are so loose that they can’t keep the shoulder fully located any more, leading to subluxations (partial dislocations where the humeral head slides partially out of the glenoid socket and then back in) in certain positions. The initial treatment of Atraumatic Shoulder Instability involves strengthening the muscles around the shoulder, the Rotator Cuff and the shoulder blade muscles. The hope is that these strengthened muscles will be able to stabilize the shoulder enough to compensate for the stretched-out ligaments. This specific strengthening protocol is effective in decreasing symptoms of Atraumatic Shoulder Instability in 80%. Muscle strengthening is not as effective for those who have sustained a Traumatic Shoulder Dislocation. For these individuals, the chance of re-dislocation / developing chronic instability problems is related to their age at the time of the first dislocation. The younger the person is when he/she first dislocates, the greater the risk of future problems. In athletes < 20 years old who dislocate a shoulder, the rate of having another shoulder dislocation is as high as 90-96%. The rate of recurrence drops to 50-75% in those 20-25 years old. In patients >40 years old, re-dislocations are uncommon. The length of time the shoulder is immobilized in a sling following dislocation makes almost no difference. In older patients who have had only a single dislocation and who are not engaged in contact sports, physical therapy to strengthen the muscles about the shoulder may be enough to decrease symptoms and prevent further instability. And while immobilization in a sling or other similar device does not decrease the re-dislocation rate, avoiding bringing the arm up and back (as when throwing a ball) and avoiding sports for six weeks can help lower the chance of another dislocation. However, young athletes who have sustained even a single shoulder dislocation and who are unwilling to give up their athletic activities, are a different story. These young people should probably have an Arthroscopic Shoulder Stabilization, also known as an Arthroscopic Bankart Repair, performed to stabilize their shoulder. If the shoulder is not stabilized, the chance of having more dislocations, and further damaging the cartilage and ligaments of the shoulder, is extremely high. Keep in mind that even a single Shoulder Dislocation leads to a 20% rate of future arthritis, and each subsequent dislocation increases that risk. 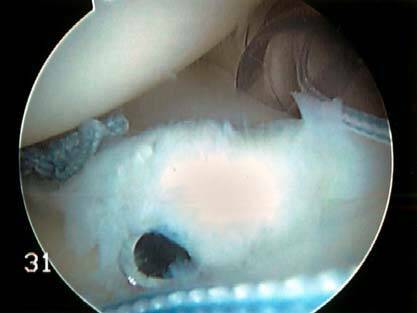 Overall, following Arthroscopic Shoulder Stabilization, the rate of recurrent instability is 7-10%, compared to 46-58% for those treated without surgery. A government-sponsored review noted a 68-80% reduction in the risk of recurrent instability in young patients who underwent Arthroscopic Shoulder Stabilization compared to those who didn’t. Patients who had Arthroscopic Shoulder Stabilization had significantly better outcomes, better function, less shoulder joint damage, were more satisfied, had a better chance to return to sports, had an improved quality of life and even had lower overall treatment costs. Not having the shoulder stabilized allows multiple subluxations and/or dislocations to occur, which causes additional damage to the shoulder’s ligaments, increases the risk of arthritis, and erodes bone from the shoulder joint that is necessary to keep the shoulder located. Once significant bone loss has occurred, arthroscopic procedures will no longer be predictably effective and open surgery may be required to place new bone into the shoulder joint. 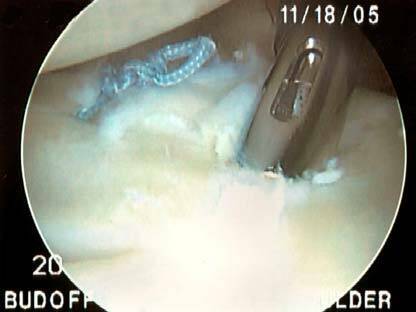 Early Arthroscopic Shoulder Stabilization significantly decreases the chances of developing these future problems. Therefore, Arthroscopic Shoulder Stabilization should probably be performed following the first shoulder dislocation in young athletes 25 years old or younger, professional athletes, or in those in whom another dislocation could be disastrous, such as mountain climbers and construction workers that work at heights. If the shoulder dislocates a 2nd time, an Arthroscopic Shoulder Stabilization should probably be performed, regardless of the person’s age. Arthroscopic Shoulder Stabilization should also be performed if there is pain due to recurrent subluxations that is not resolved by strengthening exercises and acceptable activity limitations. Modern Arthroscopic Shoulder Stabilization techniques lead to 92-97% good-excellent results, with 91% of high-demand contact athletes returning to their sport. The problems created by shoulder dislocations are different for people over 40 years of age. While older patients don’t usually suffer recurrent dislocations, 54% have their Rotator Cuffs torn by the dislocation, leading to pain and weakness. Therefore, patients over 40 years old who dislocate a shoulder should have an MRI to diagnose any Rotator Cuff Tear that may have occurred. If a Rotator Cuff Tear has occurred, it should be surgically repaired to maximize function, minimize pain and lower the chance of having another dislocation. For best results, this should be done within 6 months. 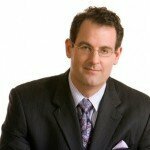 An Arthroscopic Rotator Cuff Repair is usually very effective treatment. Please see the ‘Rotator Cuff Tear’ section for more information. 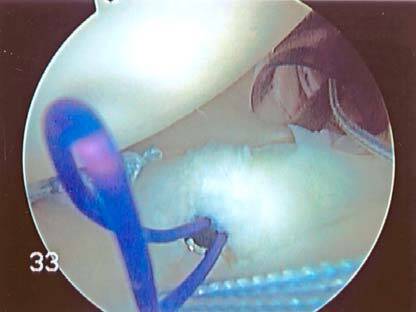 Arthroscopic Shoulder Stabilization (Bankart Repair) involves placing suture anchors (little plastic harpoon-heads with suture in them) into the glenoid socket and using the attached sutures to repair the shoulder ligaments back to the bone. Any abnormal stretching of the shoulder ligaments is tightened up as part of this repair. After surgery, keep the arthroscopy portals (stab wounds) clean and dry for 24 hours. Before 24 hours, bathing is fine; just keep the shoulder above water and don’t get the dressings wet. After 24 hours, the wounds can get wet in the shower, just blot them dry. Don’t submerge the wounds under water until the stitches are removed, which usually occurs at the first post-operative appointment after 2 weeks. The elbow, wrist, forearm and hand can all be moved early on, to prevent stiffness. During Shoulder Arthroscopy, fluid is placed into the shoulder. This fluid will leak out over the first 2-3 days, and is not blood..
Typing and computer use can start the night of surgery. The arm is kept in a sling for 4 weeks, even at night. When in a ‘controlled environment’ the sling and be removed and the arm used to eat, work on a computer, and for most other light activities as long as it’s kept in front of the body. With the head facing forward, without moving the neck, if you can see your hand, that’s fine. Do not perform heavy lifting or reach back behind the body for 4 weeks. Motion exercises are started after 2 weeks, usually as a home program. Some therapy is often required..
A word of caution: Lasers and radiofrequency (heat-generating) devices that shrink the ligaments were popular a few years ago. However, they have an extremely high rate of failure, up to 25-50%. In addition, these devices can cause serious complications, such as arthritis, destruction of the ligaments, and severe untreatable shoulder pain and stiffness. Because of these significant problems, lasers and radiofrequency are no longer recommended to stabilize the shoulder. Following multiple dislocations or if a shoulder is left dislocated for a number of hours, bone loss of either the humeral head (ball) or the glenoid socket may occur. Bone loss can lead to very severe instability, including dislocations without raising the arm, during routine activities of daily living or while asleep. If significant bone loss is suspected, a CT scan is needed. MRI cannot be relied upon for to evaluate bone loss, as MRI often underestimates (misses) the degree of bone loss. 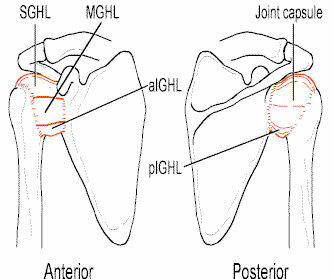 If less than 20-25% of the glenoid is eroded, the shoulder may still be treated arthroscopically with good success. However, if >20-25% of the socket has been lost, open surgery will often be required to replace the lost bone of the socket with bone from another part of the shoulder. This open surgery (Modified Laterjet Procedure) is still an outpatient procedure and leads to good or excellent results in 83-95%. When the humeral head dislocates, part of its ball shape can be smashed in by the corner of the glenoid socket that it rests against in the dislocated position. 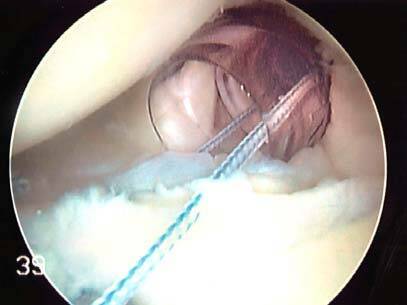 If the humeral head (ball) is damaged, unless the bone defect is very large, this can often be treated arthroscopically by repairing part of the rotator cuff into the bony defect (Arthroscopic Reimplissage). Shoulder dislocations are serious injuries. 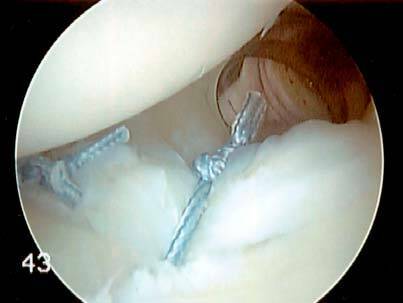 Arthroscopic Shoulder Stabilization should be performed after a single shoulder dislocation in most young athletes, and in the vast majority of patients following a second dislocation. Shoulder instability can be subtle. Often, the patient is not aware their shoulder is unstable, just that the Rotator Cuff hurts. In these cases, the underlying instability is often the primary problem that is overloading the Rotator Cuff, which the shoulder is overusing to stabilize the shoulder. 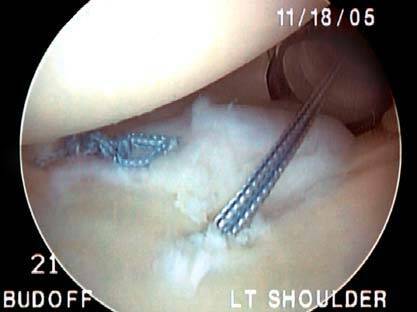 Arthroscopic Shoulder Stabilization is a very effective outpatient procedure that minimizes future problems of shoulder instability. Patients over the age of 40 who sustain a shoulder dislocation should have an MRI. If the Rotator Cuff is torn it should be repaired, which is best done within 6 months. Suture Anchor Placed Into the Glenoid Socket. Note the Sutures Coming Out of the Anchor. 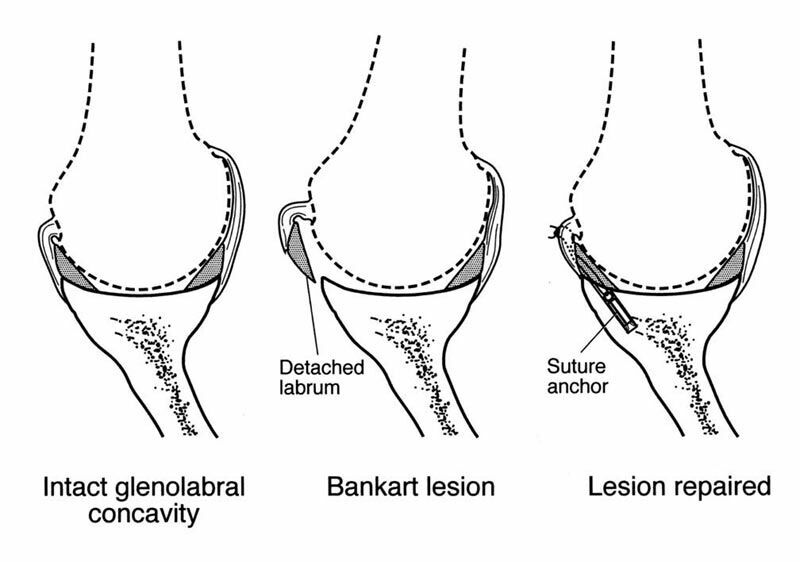 Suture Passing Devices Are Used to Pass the Anchor’s Sutures Around the Labrum (Ligament Attachment). This Device has a sharp Hollow Tip (Seen Going Under the Ligament) Through Which a Suture Loop Emerges. The Suture Loop is Used to Shuttle the Anchor’s Sutures Through the Ligament. Labrum (Ligament Attachment) Repaired Back to Bone. Note the ‘Bumper’ Effect of the Repaired Ligaments That Helps Prevent Re-Dislocation.